Cool. A portable USB DAC that’s also a headphone amp. Good news for modern man. EXTERNAL DIGITAL TO Analogue Converters (DACs) are all the rage right now, which makes a lot of sense considering the much-touted (and inevitable) demise of physical media. With more content than ever shifting online, the old silver disc spinning CD player with all its lasers, moving parts and 1980s tech is heading down the path of the dinosaurs – to oblivion. Throw in the availability of computer based high-resolution audio files and CD is looking every part of its three-plus decades of age. Just like the turntable, which withered but never died, CD players will be around for a while but it’s unlikely that anyone will ever regard RedBook compact disc playback as a hallowed and much missed artefact from the golden age of hi-fi. If you own a CD player and the laser goes bye-bye, why would you buy another one? Well… maybe if it had a DAC that could be addressed by external digital sources, but otherwise? Not likely, when there are DACs available that sound fabulous, support high-res audio and can deal with a number of digital inputs – Rotel’s excellent DAC comes to mind, or if you’ve got a pile of money sitting around, something like the dCS Debussy comes to mind. Arcam’s great looking matt black rPac is something of a different proposition to most all of the DACs we’ve looked at over the years. It’s tiny and powered entirely by the USB connection, which is also the rPac’s only input. 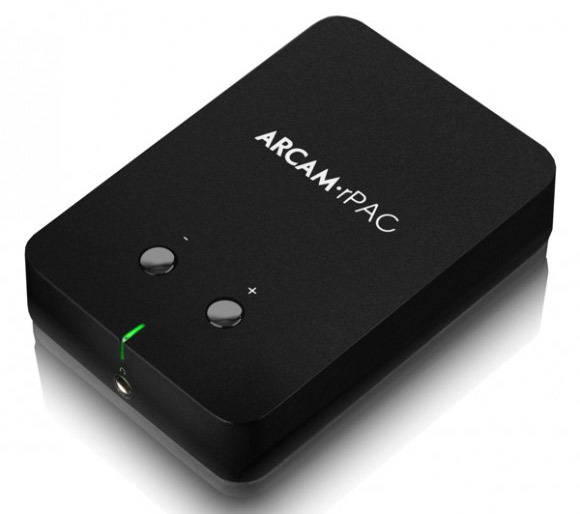 Arcam has labeled the rPac as a personal DAC, calling it a “pocket sized solution” and going so far as to supply a plush soft carry pouch. I’d agree with that assessment to a degree because this little unit really is compact – at a mere 100 x 62 x 25 mm (w x d x h), the rPac is about the size of the much out of vogue cigarette packet, although at 300 grams, the cast aluminium chassis is twice the weight of an iPhone. So the rPac is small enough to be pocketed but it’s not really designed for portable (i.e. mobile) use, seeing as it would be all at sea without a computer’s USB port. Drop it into a laptop bag or backpack and it’s the perfect device to take anywhere, from the library to the café or work and home. No power supply or batteries needed – just the supplied USB cable. The small form factor is perfect on a desk because the rPac doesn’t chew up valuable real estate, while the substantial weight and the rubbery base mean it won’t slip and slide around every time a cable is bumped. 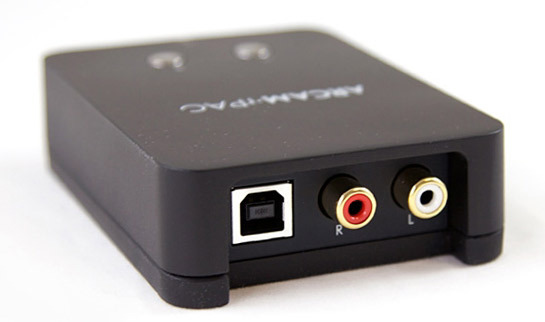 Technically speaking, the rPac is more than just a USB headphone DAC; it has RCA analogue outputs, so it can be connected to any audio system with a spare input. That said, it’s really going to be at its best in a headphone or desktop environment, rather than being plugged in and out of a hi-fi system, although it will work perfectly well in that situation. There’s not much to look at or fiddle with here – you get the aforementioned USB and RCA connections round back, plus a 3.5mm minijack round the front with two slightly raised silver metal buttons on top giving volume and mute control and a three-colour LED to indicate status (synced data rates aren’t displayed in any way on the rPac). The rPac supports Windows and Mac computers but won’t talk to Linux boxes. The USB connection is fully Asynchronous, which bodes well for the sound quality but in a strange touch, the rPac will deal with 24/96 audio files but won’t have a bar of 24/192, which is where you really want to be these days if you’re offering any high-res support at all. It should go without saying that the rPac is pretty much useless as a headphone amp without a good set of ‘phones. Listen to a set of the el-cheapos that come with a portable player or smart phone via the earphone port on your computer and you’re not likely to hear much of a difference when you compare that experience to the rPac’s sound. However, the better the ‘phones, the more the rPac comes into its own. Sony’s XBA-4 in-ear balanced armature ‘phones cost the same as the rPac and they do a great job at dragging every bit of ability from the 3.5mm jacks of everything from my iPod to my MacBook Pro. However, they’re also so detailed that they easily highlight just how much the rPac adds to the sound compared to the 3.5mm jack on the Mac. From the enjoyable but slightly thin and cold character of the Mac’s output, the rPac adds a much-needed dose of warmth and richness along with a serious amount of extra punch and impact. This makes power tracks such as Big Boi’s ‘Shutterbug’ from Sir Lucious Left Foot: The Son of Chico Dusty or Awolnation’s ‘Sail’ from Megalithic Symphony a different cup of tea because they’re far more gratifying with all that extra slam. This level of enhancement was a touch unexpected because the XBA-4’s aren’t all that hard to drive, but they loved the rPac’s extra power and grip. There’s more audible detail on offer as well, which improves all kind of music from the hard stuff to the mellowest of jazz vocals or acoustic guitar strumming. This is thanks to the Asynchronous USB connection and what has to be a dramatically better quality DAC chip, not to mention much higher quality power circuitry (the whole audio chipset in the Mac, right down to the amplification probably costs Apple a few cents). Throw a set of ‘phones that are more difficult to drive (like my Sennheiser HD650’s) into the equation and the difference is even more noticeable. The Mac does an okay job pushing the Sennheisers but you can tell that it’s struggling – the overall sound is lean, dynamics restrained, detail levels curtailed and the sense of involvement is lacking compared to the way these ‘phones can sound with decent amplification. This comes as no surprise because high-end ‘phones like the 650’s are designed to be run from a headphone amp, which is where the rPac comes in. It does a very commendable job here, certainly delivering a fuller sound with more grunt behind it. There’s no doubt that the 650’s drivers are under more control. The only issue here is a volume limit – with the Mac and the rPac turned all the way up, the levels are only just enough to be considered too loud, which means that there might not be enough headroom on hand with tracks recorded at a lower level. This is only going to be an issue in certain rare circumstances and even then, only for headbangers with ‘phones that are difficult loads. The rPac is quite capable of giving higher resolution files the right treatment. Playing a selection of 24/96 sample tracks from the HD Tracks website left me in no doubt that I was listening to not only very high quality recordings but also to a good source (i.e. a low jitter USB DAC – not the Mac, which is only acting as a digital storage device being told what to do by the rPac) as well as a capable headphone amplifier. The sense of air and space around the instruments was impressive, as were the vocal and instrumental textures and timbre. The presentation was only marginally warm, which is about right for these ‘phones, and it was definitely way ahead of what was coming from the Mac’s 3.5mm jack. To verify the quality of the rPac’s digital to analogue conversion, I ran its RCA outputs into my Perreaux SXH2 headphone amp via a set of cryogenically treated 0.5m Slinkylinks silver interconnects. The difference in audio quality was there but it seriously wasn’t enough for me to worry about, with the Perreaux having a more explicit, highly detailed sound with a fair amount more available volume and a little more overall power and punch. Some might prefer the dash of warmth coming from the rPac; others might not but then again, the Perreuax is a lot more expensive and it’s just an amp, you’d still need to add a DAC to the shopping list. Arcam’s compact rPac is a well-engineered piece of hi-fi equipment, complete with Asynchronous USB functionality and the build quality of a much higher-end product. To call it a mere device does it no justice at all. Sonically, it’s the real deal – both as a headphone amp and as a USB DAC feeding an external amplifier. The only real anomaly is the lack of 24/192 support. Although it’s by no means cheap, it’s not wildly expensive either; you can buy superb DACs with full 24/192 support and additional digital inputs for not much more money (the Zero DAC for example) but they cover a different segment of the market.